Thakorebhai Desai Auditorium, Law Garden Road, Ahmedabad, India 380006. For more details contact: +91 – 98256 11935 (Mr. Hardik Joshi). 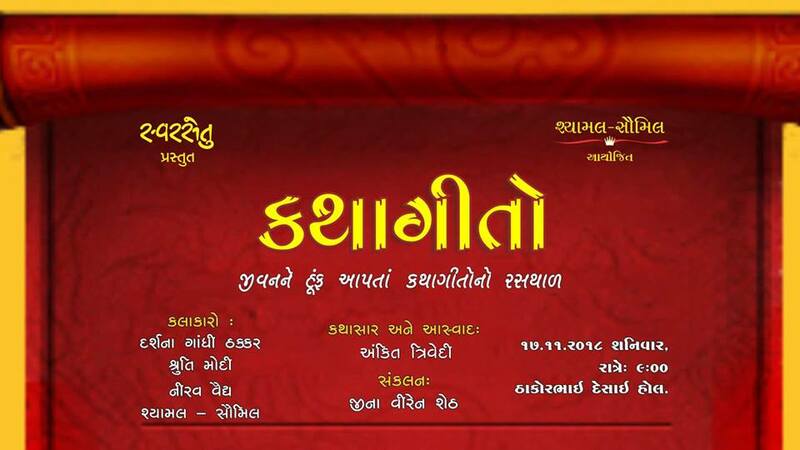 Swarsetu presents “Katha Geeto”, a musical rendezvous of soulful Gujarati and Hindi songs that will not only soothe the ears but will also comfort the heart. Each of these carefully curated songs has a riveting story or a character from our rich history and culture as the backdrop. Celebrated singers such as Darshana Gandhi, Shruti Modi, Nirav Vaidya and Shyamal-Saumil will enthrall the audience with their melodious voices. The songs have been compiled by Jina Viren Sheth and the event will be compered by the much admired Ankit Trivedi. A musical extravaganza not to be missed for the music connoisseurs. Please note this event is only for Swarsetu members.